How pallets make beautiful walkways? Wooden pallets are a valuable source of reclaimed wood, making them perfect for environmentally friendly projects with a focus on recycled materials. They can also be obtained very cheaply or even for free, making them extremely cost-effective. People have built everything from furniture to garden sheds using this type of reclaimed wood, but one of the most consistently popular options is walkways. Reclaimed wood walkways are perfect for use in a range of places. Many people install them in their gardens. This makes for an attractive, unique path with a natural feel. The wood often also has a rustic look, which many people like to have in their gardens. An affordable, easily installed wooden walkway such as this is also ideal for events held in fields. Fields are used to host all kinds of events, from music festivals to craft fairs, but in wet weather they can suffer from muddy ground. 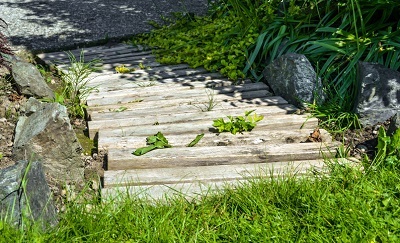 A walkway can be quickly constructed from reclaimed wood and removed when the event is over, creating a safe, dry place for visitors to walk around. 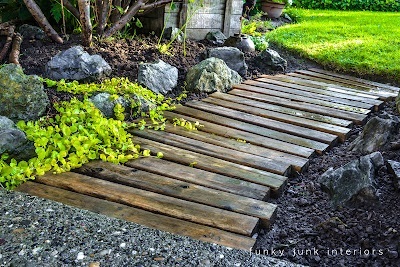 The simplest and easiest method for creating a walkway involves keeping the wooden pallets whole. They can then be used as sections and pieced together to form a path of your chosen shape. If this is being done for an event in a field and minimal digging is allowed, it might be possible to place each section directly on the ground as long as it is quite flat. Otherwise, it is preferable to dig out and level off the section of ground in which the path can be laid more securely. You can either dig deep enough to make the final path level with the surrounding ground, or dig a slightly shallower trench to create a raised path. The second method for making a walkway is a little more involved. This makes it best suited to paths that will stay in place for some time, such as a path for your own garden. Instead of using the complete structures as sections, this method requires that they are dismantled to obtain individual wooden planks. Then use a spade to level off the section of ground where you want to lay your path. You may want to also spread out a thin layer of sand on the area. This will make it easier to get the surface perfectly level, and reduce the likelihood of planks moving over time. Next, lay out the planks, starting at one end of the path and working towards the other. Tap each plank down with a rubber hammer, and before you move onto the next one make sure it is quite firm. Repeat this process until your entire path has been laid. If you want to, you can lay some sort of stone border, which will further help to prevent movement as well as being decorative. This is also a slightly more flexible method. It makes it easier to create a curved path, and gives you more choice about where to include turnings. Furthermore, if you want a narrower path, you can easily saw the planks to your chosen length.